This afternoon Esther and I drove down to Olympia to visit my sisters and mother. 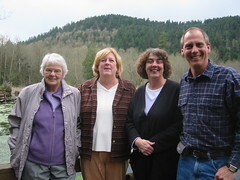 Ellen is on spring break and up from Sacramento, and Susan picked up mom from Lynden. We took a long walk around McClean Pond which is about a mile from Susan's house. Mom enjoyed her walk, though she had to maneuver through mud puddles and slippery boardwalks. It was great to spend time together and we are looking forward to Ellen and mom staying with us later this week.